From the 1950s through the 1970s, husband-and-wife designers D.D. and Leslie Tillett designed and printed custom fabric yardage in their studio on Manhattan’s Upper East Side under the name “House of T Fabrics.” Their fresh and original aesthetic, paired with Leslie’s technical innovations, earned them a loyal following and recognition in the Museum of Modern Art’s Textiles USA, Cooper Union Museum’s Design by the Yard, and other contemporary exhibitions of good design. Leslie learned textile printing from his father, George Tillett, who was a third-generation printer from England. One of George’s innovations was the drag box – a tool for pulling stripes of ink directly onto cloth without the use of a silkscreen. The box is a receptacle for ink, which is released in a controlled flow through a narrow slit at one end. George mounted the boxes on a tilting carriage to create a striping machine, as continuous vertical stripes could not be printed using the flatbed screenprinting process. Leslie experimented with a loose box which enabled other effects, like overlapping bands of ink to create darker stripes of varied widths or creating irregular, curving, or horizontal stripes. Drag Box Plaid is a tour de force of the technique. 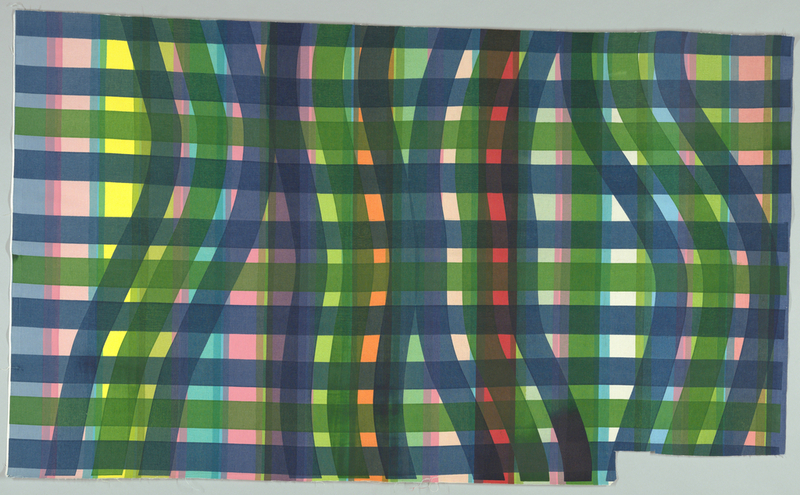 Hand-pulled stripes of red, pink, orange, yellow, teal and blue are overprinted with an activated plaid of straight and curving lines, also hand-pulled, in emerald green and navy. This post highlighting women designers looks suspiciously like a post about two men. And she is ever so briefly mentioned, before the post goes on to discuss contributions of Leslie and George at length.